Delaram Saadi obtained her J.D. from the University of Detroit Mercy in 2010 where she amassed significant experience by learning from some of the best litigation attorneys in the U.S. and Canada. She then articled for a small firm in Richmond Hill, Ontario and became acquainted with the real legal challenges faced by many on a daily basis. Ms. Saadi was called to the Ontario Bar in 2012 and founded Saadi Law the same year driven by a passion for service and a world-embracing vision. Ms. Saadi also holds certification in Mediation and Alternative Dispute Resolution from York University and is an instructor of the Paralegal program at a local college in Toronto. Saadi Law employs a well-rounded staff of hard-working and devoted individuals with over 25 years of collective experience and exceptional service-oriented attitude. 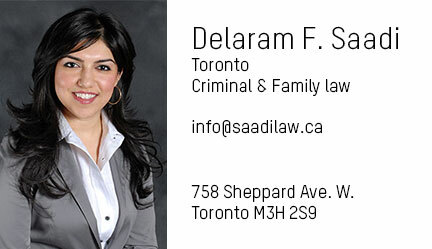 Ms. Saadi is an active member of the Law Society of Upper Canada and the Criminal Lawyers’ Association.